Well Christmas has passed and the New Year is right around the corner. Almost all the presents have been given and received (Adria, I’ve still got yours waiting under the tree for you!). And, as usual for me post-Christmas gift-giving, my mind is conjuring up ideas for next year! 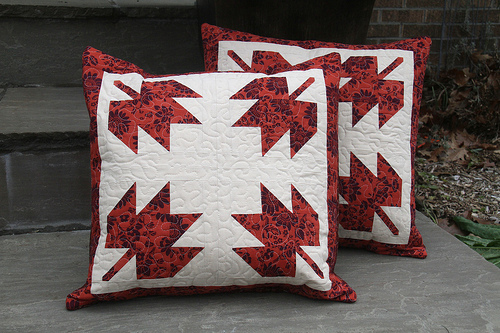 While I tuck away those secret lists, and make use of my time off to put my basement sewing/crafting/stashing workspace back in order (the holidays always turn our basement into a disaster zone), here’s a post about one of my favourite creations this holiday: a pair of Maple Leaf Pillows for my mother-in-law. 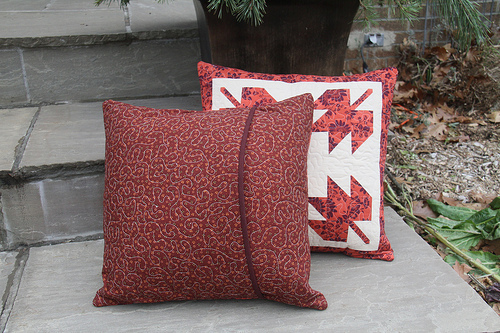 I made similar pillows to these earlier this year for my friend in Norway, using bright reds and whites, but I had also thought this design would be a lovely addition to Chris’s parent’s cottage in Coboconk, Ontario, where their living room enjoys a beautiful view across the widest part of Gull River. I originally considered doing each leaf a different colour for the season, but of course maple leaves fall off for winter, leaving one of the four seasons problematic, and I couldn’t come up with a symbiotic mix of colours from my fabric stash. To make colour choice even more challenging, the room where these would go at the cottage isn’t entirely finished renovations yet; it will eventually get new flooring/carpeting (right now it’s a slate-blue colour), and probably new (matching) furniture. But Chris’s parents paint virtually every room some form of beige, and the living room is no exception, so I decided to use a beige fabric for the negative space and to create the leaves and other details in warm reds and browns. These are left over fabrics that I originally used for my Party Mix Tape quilt (Elizabeth Hartman design). I’m very pleased with the results, even though the pillow covers are a teensy bit tight over the pillow forms; I had a bit of a brain fart while figuring out if I had the right amount of fabric left for the red borders on the pillow fronts (I have issues calculating square yardages for some reason, and I’m generally challenged in the mathematics department). I actually had plenty of fabric left because I had folded my fabric in half for easier cutting, but my brain fart involved leaving that factor out of my calculations before I started cutting, and to ensure I had enough I tightened up my border measurements, but I only realized my mistake after cutting more than enough — in fact too many — border pieces. Duh. HUGE forehead smacking moment right there. Unlike the pillows I made for Norway, I kept the backing of these very simple, mostly to hurry along the project, which I completed over a long weekend a few weeks before Christmas. Also for speed and to learn something new, I tried machine binding for the first time on the pillow backs, using this tutorial from Red Pepper Quilts. 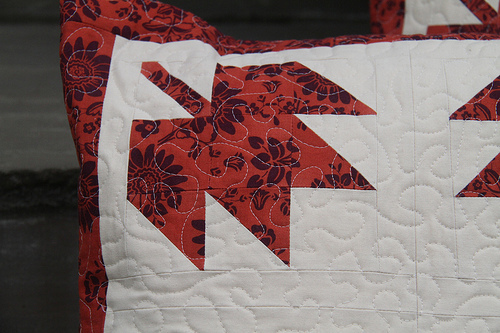 This is a great project for practicing the technique, because one side of the binding is hidden by being on the inside of the pillow, and so if you don’t quite get your technique down perfectly, it’s not going to be as visible as it is on a proper quilt. Anyway, these pillows will provide many years of enjoyment while nestled on the sofa, enjoying a warm fire and the beautiful serenity of the cottage. I hope you all enjoy a wonderful New Year! P.S. I just might write these pillows up as a pattern at some point… if there’s a demand for it! Next Post I can ski. I’m a skier!